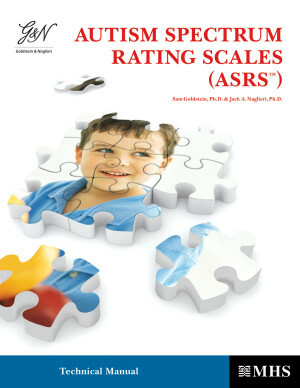 The ASRS was designed to identify symptoms, behaviours and associated features of Autism Spectrum Disorders (ASDs) in children and adolescents aged 2 to 18.The ASRS scale is an easy-to-use and convenient tool intended for psychologists, school psychologists, clinical social workers, physicians, counsellors, psychiatric workers and paediatric/psychiatric nurses. The ASRS will assist the test user in the diagnostic process. ASRS items assess DSM-IV-TR™ symptom criteria for ASDs. When used in combination with other assessment information, results from the ASRS can help guide your diagnostic decisions, treatment planning, ongoing monitoring of response to intervention, and evaluating the effectiveness of a treatment program for a child with an ASD. Parents and teachers are asked to evaluate how often they observed specific behaviours in the child or adolescent in areas such as socialisation, communication, unusual behaviours, behavioural rigidity, sensitivity and self-regulation. There are two versions: ASRS (2–5 Years) for ratings of children aged 2 to 5 and ASRS (6–18 Years) for ratings of children or adolescents aged 6 to 18. 1.DSM-IV-TR®: DSM Symptom Scale is scored based on diagnostic criteria in the Diagnostic and Statistical Manual of Mental Disorders Fourth Edition Text Revision (DSM-IV-TR). 2.DSM-5: DSM Symptom Scale is scored based on diagnostic criteria in the Diagnostic and Statistical Manual of Mental Disorders Fifth Edition (DSM-5). Scoring Software users can download the software by clicking on “Check for Updates” under the Help menu within the Scoring Software. After the updates have been installed, users will have the option to choose to score with the DSM-IV-TR or DSM-5 criteria. Updated DSM-5 hand-scored forms for the ASRS Parent and Teacher forms are now available for purchase. The scales provide scores based upon a normative sample, aged 2 to 18 years, of a diverse group of individuals.